I've been asked to be part of an upcoming invitational event commemorating the sesquicentennial of General Sherman's buring of Columbia. The project is called Art from the Ashes and is being presented by Jasper Magazine and Muddy Ford Press in conjunction with One Columbia and Historic Columbia. Ten visual artists, a film maker, and sixteen writers were invited to participate. There will be a big exhibit at the Tapps Art Center in February 2015. A book will also be published. Obviously, a great deal of research is needed in order to creatively respond to such a historic theme. To that end, there was a series of four, informal yet in-depth discussions led by leading historians. I attended all four and also visited the Woodrow Wilson Family Home (which is here in Columbia ... and is also the only museum in the country dedicated to the Reconstruction Period.) I love history. The speakers were very, very good. Now, it is time to make artwork! I'm not a Southern but I'm also not a Yankee. My Dad came to this country in 1952! I don't really belong here, but I've lived here longer than any other place. The results of the Civil War are still with Columbia. Heritage. Hate. It is all both familiar and foreign. Trying to imagine life in Columbia during the week of February 17, 1865 is captivating, easy and difficult. It is easy to imagine what one might do in a dire situation but it is nearly impossible to do without superimposing current values and lifestyles in the mix. During several of the four educational/research sessions, there was a time for questions and answers. I asked: How many people died during the burning of Columbia? No one really knows. Where were the bodies buried? No one was sure. Who cleaned up? Everyone just laughed and said, "Of course Susan would ask!" The most reliable knowledge is that fewer than a dozen died, mainly Union prisoners being "freed". They were probably put in the potter's field just west of Elmwood Park Cemetery, near the river, near my house. The feminists in the group said, "The woman probably cleaned up!" Of course, this is probably correct. I hate war. Every person killed was mourned by someone. There's just so many viewpoints on the Civil War ... slavery, state's rights, Northern aggression, economic considerations, international alliances, biased reporting, etc. It's all highly opinionated, open to interpretation, and painful. There are conflicting stories about the burning of Columbia too, even in the original source material. Who burned all those bales of cotton? Sherman's troops or the locals trying to prevent them from falling into enemy hands? How much of the city was destroyed ... a fourth, a third, half, or as much as two-thirds? It depends on who you ask. All in all, it seems largely senseless to me ... plenty of reasoning but none of it completely sound. I knew the perfect grave rubbing to reflect my feelings: Some Day We Will Understand. It's not that I actually think this understanding might come to pass, but it certainly feels like the scholars and the historians and the people still tied to this history think that day will arrive. Understanding war is like trying to understand death itself. Some day. Maybe. Maybe not. The grave rubbing went directly onto an antique child's dress. I later added the vintage lace "belt" and two buttons. 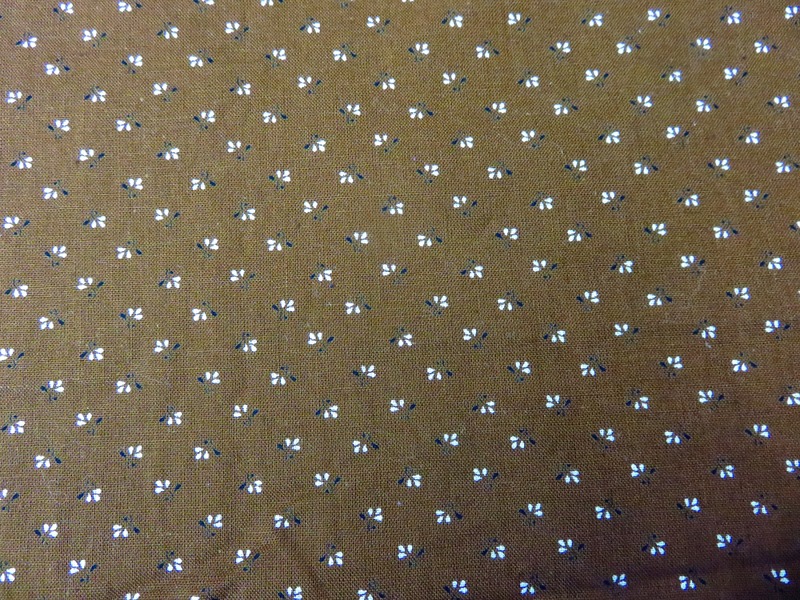 I selected this brown dirndl material. I bought it in the mid-1980s when I thought I'd make a dirndl using one of the popular Folklife patterns ... which, incidentally is still available ... #123 under Old Europe! Somewhere I might still have the pattern but I know I'll never need it! The thought of me making my own clothing is now hilarious. It would have gone badly. I loved the brown material though, still do. The tiny floral design looks like cotton! Perfect as the background for something intended to commemorate the burning of my town. Yet, the color was too deep, rich, and vivid. A few minutes in a bath of bleach and water and it was beautifully altered! The discoloration was wonderful. I put a piece of recycled, black acrylic felt (former packaging for a kayak being shipped to my friend's outdoors shop) under it and started stitching. I took it with me to Oregon and stitched in airports, planes, and in the rental car while Steve drove. I used all sorts of threads and yarns. The entire surface was covered in rows about 1/8" apart. Okay ... I admit it ... I drew an outline of the garment on the material before I started. My stitches weren't quite as tiny in the area that I knew would be covered up. Still, I knew to stitch there too. 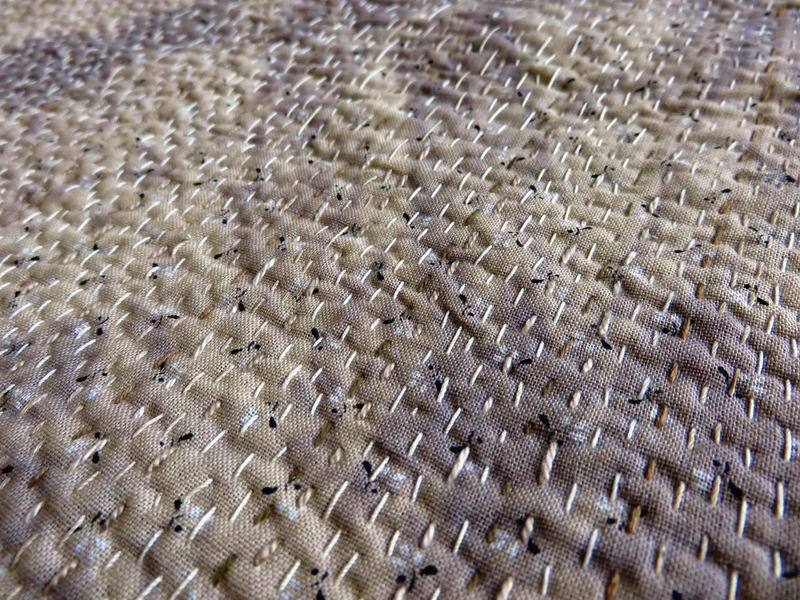 After all, this sort of dense stitching shrinks the overall piece considerably. I wanted this background to lie flat! 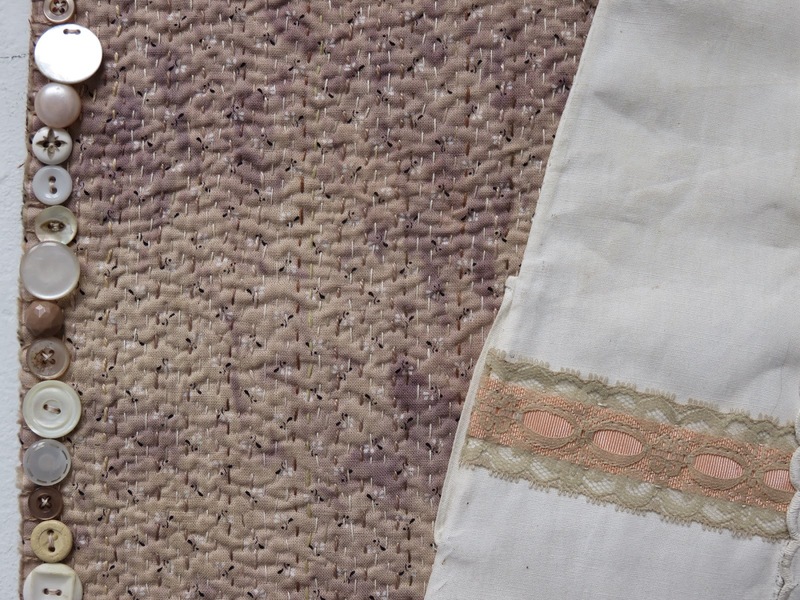 Finally, I appliqued the garment to the background, blanket stitched the edges, and added the vintage lace and buttons. To finish it off, I used the same brown dirndl material for the reverse ... just a piece that wasn't discharged with bleach. Generally, I pin each piece to the gallery wall and photograph both the front and the reverse. This time, however, I forgot the reverse. Yet, I like seeing the proportions of it while Steve is holding it. The back is special. Why? 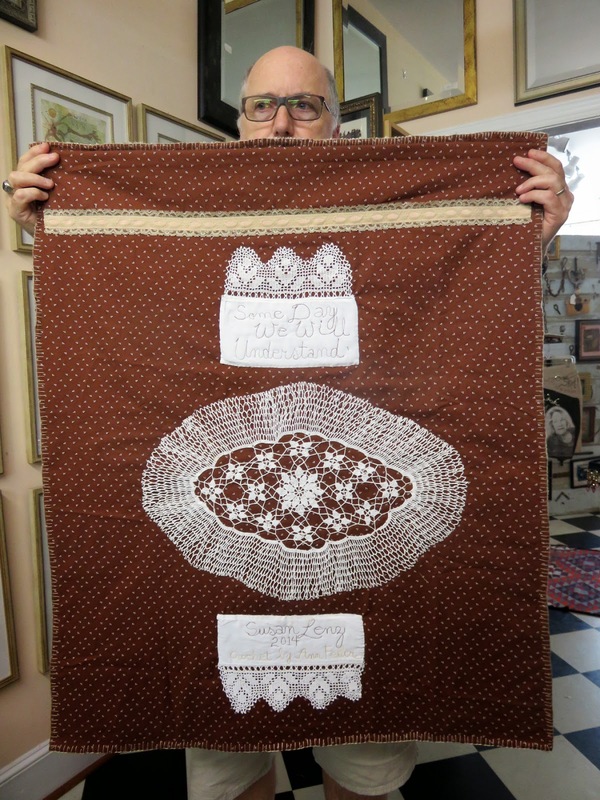 Well, in addition to the former dreams of a brown dirndl, it includes three pieces of crochet given to me by Ann Feller. Ann was married to my Dad's first cousin John Feller. (John passed away a few years ago.) I used a large piece for the center. These pieces are important. Why? Well, the dirndl material is really a "false back". It is only attached to the front along the four edges (sort of like a giant pillow) ... until I applique on these vintage pieces. I hand stitch them to the back ... but in the process I also pierce the black acrylic felt in the center. Thus, all three layers become "one". I machine stitched the title on one small piece. 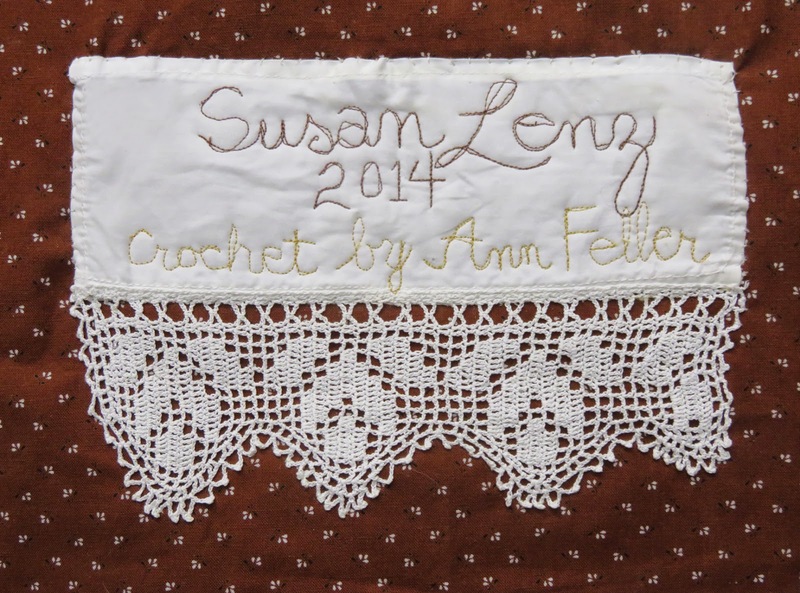 I signed my name and the date ... but added "Crochet by Ann Feller". Thank you Ann! I am honored that you wanted me to turn these pieces into art. It is wonderful to know that my family truly understands why I love these precious pieces! 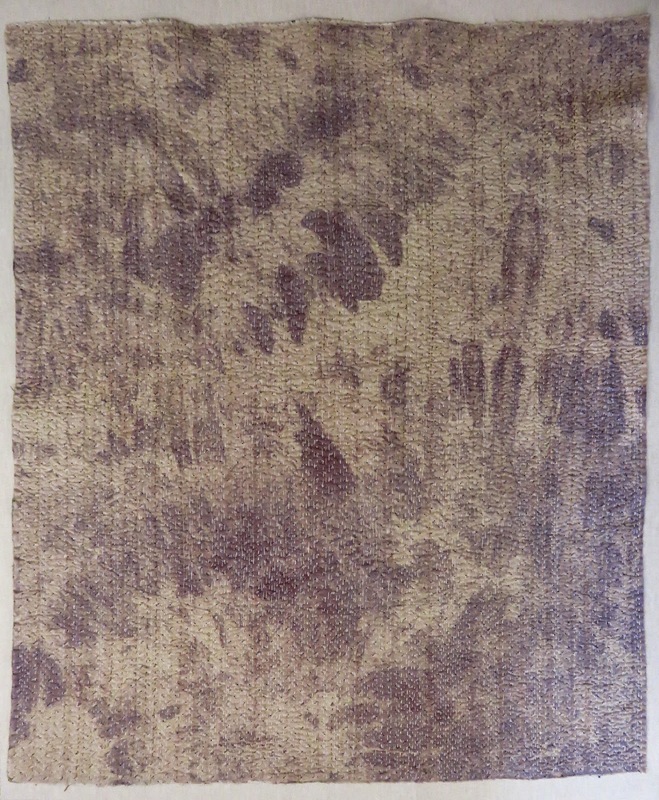 I am linking this post to Nina-Marie's "Off the Wall Fridays", a site for sharing fiber art creations. Another thought provoking piece. 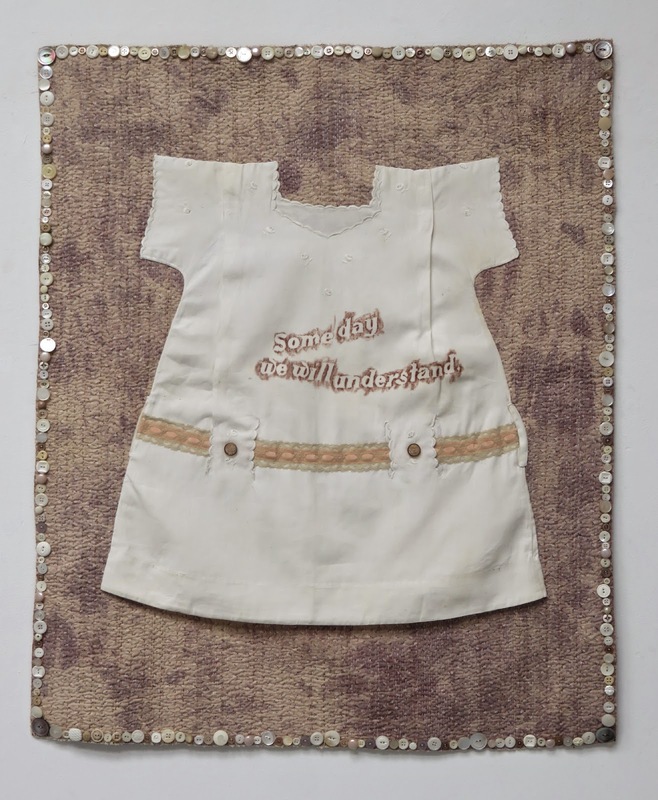 When I first saw the tiny dress with the rubbing "Some Day We Will Understand",my thoughts went to the tiny Wee Care gowns I stitch. The tiny gowns dress sweet tiny angels that are still born or pass soon after birth. I know these tiny angels leave the families distressed and wondering why....The Some Day We Will Understand, could describe those that have lost those sweet little ones. I told you the piece was thought provoking! My heart melted when I read Mosaic Magpie's comment. 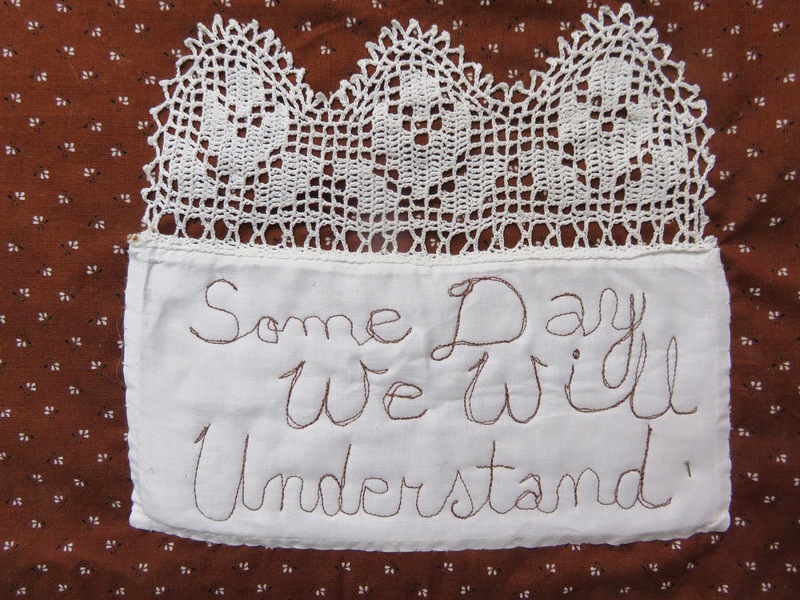 I too was thinking of all the instances when the words "some day we will understand" are read. You express so many people's thoughts...on whatever war it is. Of course, I have my own thoughts on this subject having been with the U.S. Army for 20 years over here. But your writings definitely touch the Soul. And the Piece? Oh my goodness. You are absolutely right...your Family DOES understand. You have honored Anne Feller like no one else could have done. And Mrs. Foote. And the wonderful memories the Dirndl material brings back...wonderful. How is it that you can always get me to cry? Still. Even now that we are all grown up. What a beautiful piece. And a very moving post. Such a wonderful piece and I loved reading the story behind it. I can't imagine doing all that hand stitching, but it is perfect for this piece. The back is fabulous, too. Bravo!